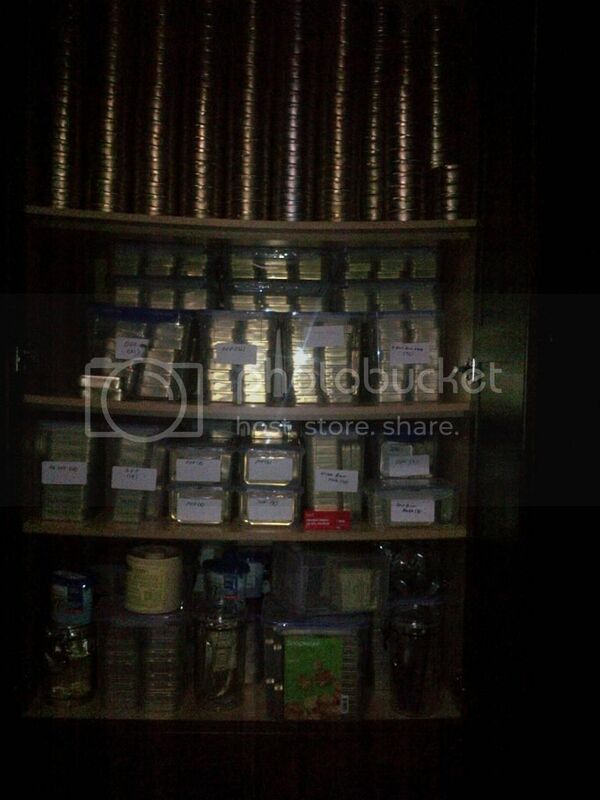 About 2 months ago I stocked up on some of my favorite bulk blends. After distributing it among my Ball half-pint canning jars (with flats and rings), I placed it in my cellaring room that stays about 72F degrees year-round. Recently, I've been hearing the jars "pop" as the jar "cans" itself. Is this normal? I'm assuming the air in the jar is being consumed by the aging process so it is drawing somewhat of a vacuum? Yes this is normal. The change in temp. will do this. Yep, I usually check my jars after a few days and they've usually sealed themselves by then. yep, that sound is normal. I leave them for a week after filling them and then I check them to ensure they are sealed. I then dip the top of each jar into melted paraffin wax until just past the lid line. Recently, I've been hearing the jars "pop" as the jar "cans" itself. Yep, perfectly normal as the microbial effects of the tobacco in the jar develop. Just check the tightness of the seal -- making sure the screw-top is good and tight -- after a few weeks. I don't use wax, or "can" the jars with hot water, etc. I fill 'em to 1/4 inch from the top, seal them tight, check them as stated above in this post, and let 'em age. Anything more, IMO, is overkill. I've been doing it this way for decades and have never had a problem. My middle name is overkill, lol. I saw a thread on another forum where some of the guys lids started to rust and the seal in the canning jar degraded. Someone said they protect against this by using wax, so I thought what the hell - I had an old slow cooker, bought a block of high quality paraffin wax, liquified the wax, and dipped all my jars. I don't know if it will do anything but at minimum the jars look really cool, lol. The lids to Kilner jars are glass, so they won't rust. The gaskets give a very good seal, but I'm more concerned about your comment about the possibility of the rubber perishing? You will mock me but another thing I use those bale jars for is to hold my 16 oz tins of Briar Fox. I have heard many say these large tins are unreliable and are prone to rust and separation. These large tins fit perfectly into those airtight silicone bale jars, which should help protect them. The only other tobacco I collect that I buy in large tins is Anni Kake, but I mason jar that stuff because it is so wet - I am worried even if I bale jar the AK, the moisture will cause internal rust. Are the seals in the Kilner jars silicone or rubber? All the glass bale jars I have seen up here have rubber seals. Only the acrylic ones I found at walmart had silicone seals. Tobacco is expensive. Even if money is not important, it is important to avoid the disappointment of losing some well aged, cherished blend, and thus doing everything possible to avoid it. Regarding the rust issue, such problems, IMO, are caused mostly due to the ambient temperature (too hot) and humidity (too humid) in one's cellar. It's a bid humid here on the coast, so my cellar, being in a walk-in closet, has a container of "Damp-Rid" which keeps the humidity well under control. Damp-Rid is inexpensive (I get it at Wal-Mart), it works very well, and it's easy to tell when the container needs to be replaced. It lasts more than a year for me, but how long it lasts will depend on the temperature and humidity in your own cellar. The Kilner jars (at least the ones I've seen) are PET food safe plastic, not glass, the bails are stainless steel and the seals are silicone, not rubber. They will outlive us. You will mock me but another thing I use those bale jars for is to hold my 16 oz tins of Briar Fox. I have heard many say these large tins are unreliable and are prone to rust and separation. No, I won't mock you at all LOL. The only "problem" with the larger jars, for me anyway, is I don't like interrupting the aging process unless I am opening a jar to smoke the contents up. The larger jars, for me, are too big for this and I'm not one to "restart" the aging which will occur with those larger jars. Assuming that the jars are filled at a temperature greater tan 72F, this appears to simply be an application of Guy-Lussac's law. When the jar is filled the air and vapor pressure equilibrates with the ambient pressure of the atmosphere. Sealing the jar makes it a closed constant volume system, As the temperature drops, the pressure inside the jar lowers. Since the pressure inside the jar is now lower than the ambient pressure, a vacuum occurs. This is what I think is happening. Ross, I use the Damp-Rid too, just in case, lol. Here are a couple of shots of my cellar - it is a little disorganized at present because I am moving stuff around to install another shelf because one of my shelves is starting to bend a bit. In the first shot, you can see my bale jars and how they are used. Can't be too careful, Peck. But hey, since just one of those containers holds 18 tins, in essence, $170 USD of tobacco, on average, being "overly cautious" isn't necessarily anything to dismiss. I was chatting to one of the guys on here sometime back and he told me about using those silicon air tight containers. He said he lost several square and rectangular tins over the years. 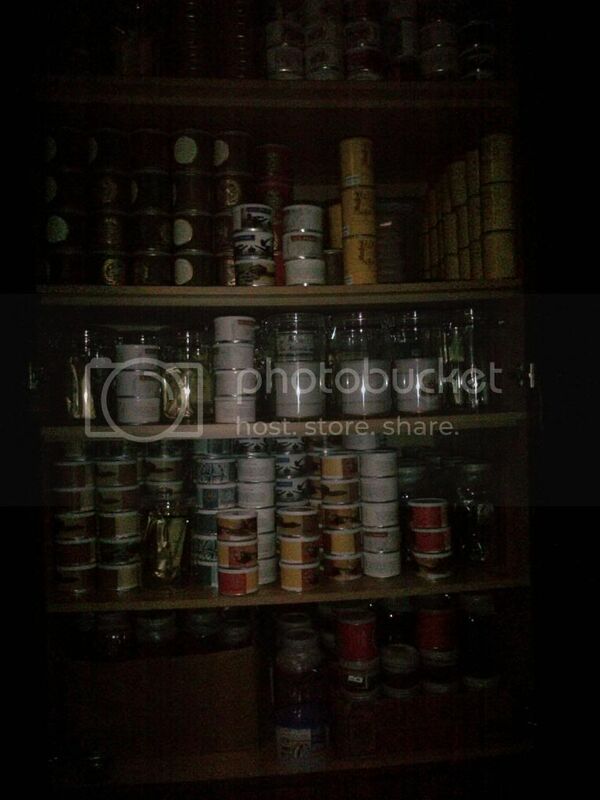 He said he has been using these for the last number of years, and even then, on ocassion when he opens up the container he smells tobacco because the one or two of the tins have lost their seal. However, the tobacco was still good and was not dust like it would be if the tin popped outside the container. He also said that he has less tins lose their seal in the first place because the container acts as a buffer against temperature and air pressure changes. That said, others have told me they have had no issues with the square tins (though over how many years I am not sure)- still, if you want to cellar the stuff for 20 or 30 years being cautious I thought made sense. Good God, Peck! That is the MOTHER of all cellars! flakeyjakey, there are 2 types of Kilner jar, the glass lid clip type and the metal screw ring/lid type. For long term storage I would prefer the screw lid type. Thanks rebornbriar - that's what I needed. I have been using the version on the left. I will now keep the tobaccos in them for relatively short-term ageing (? a year) and get some on the right for the long-term. the jars are cheap, but the tobacco is not! More £££, more space! "Her Indoors" will go doolally (another word from the British Raj!). I feel the need for a pre-emptive strike - do you still do jewellery?! Love the pics Peck. Very impressive. I hope to one day have a room with ample shelving for my stash. Until then I will keep using large plastic tubs. But someday, it will be all prettily displayed on a shelf in a darkened room or walk in closet. Ok - I'm glad we're on this topic. I normally just buy the 2oz tins and cellar them as is. However, I've made up my mind that I'll be buying a few 8oz tins pretty soon. My plan is to get jars and split them up into 4ths right away. However, my original question was, should I wait to do this with each one until right before I want to have any of it? Which, could result in one 8oz sitting for a year or so, then be popped and separated, while I smoke away a fourth and let the rest sit. Or, just open box, open tins, jar and let age - done and done. After peck's display though, my seconds new question, is if I go the "wait to jar until you have to" route....do I get bale jars for the sealed tins as well? With all that -- is it really better, in the long run, to continue with 2oz tins for aging purposes? I need to go w/ the larger guys for a while because of the price (basically getting 4 tins for the price of 3), and I don't have much disposable income. So this will let me build up quicker. However, in a few years when I have some more $$ in the bank, should I switch back to just buying the 2oz, since I would be able to leave them as is and not worry about jarring? EDIT: Also, I was just looking at the Ball Mason Jar website, and it looks like the smallest they make is 4oz. I was sort of hoping for 2oz (so it'd be just like the regular tins). What size do most people use? Link? Undercagon, you can do it either way. I don't think it's a huge risk leaving the 8 ounce unopened zip-top cans in the cellar for up to a year. But as I stated, I'm jarring the 8 ounce cans when I get them within a few months of receipt. With all due respect to Peck, I've been cellaring vacuum sealed tins as is for many years without issue -- I simply check on them every 3-4 months or so. It also helps to keep them in a relatively dry, cool, dark area, so for example if it's hot and/or humid where you are storing your tobacco, you need to fix that which might required storing your stash somewhere else that's more conducive. If the tobacco you enjoy comes in 8 oz., one pound, or bulk, not everyone will agree, but to me it just makes more sense to "go large." By all means go with the larger amounts and store the contents into jars -- it's safer, considerably cheaper, and same tobacco as the 2 oz. cans/tins -- it just makes too much sense. I was just looking at the Ball Mason Jar website, and it looks like the smallest they make is 4oz. I was sort of hoping for 2oz (so it'd be just like the regular tins). What size do most people use? Link? I use the plain ol' regular 8 oz. screw top jars -- each holds about 3 oz. or so of tobacco, 67 cents each -- $8 for a case of 12 jars at Wal-Mart. How much they hold really depends on the blend ... I just jarred 500 grams (17.6 ounces) of Gawith & Hoggarth Bright CR Flake and the 500 grams all fit into four of my 8 ounce Ball jars. I use 4oz and 8oz Kerr jars that I purchase at Wal-mart. They are pretty much the same as Ball or Mason jars. I use the 4oz jars for flake tobaccos and the 8oz for bulk, loose tobaccos. I find the 4oz will hold about 2oz of flake and about 1 oz of loose tobacco. The 8oz will hold about 2oz of loose bulk tobacco since I pack fairly loose to insure plenty of air for aging. I am going to buy a scale with a tare adjustment to verify these weights. The only paranoid thing I do is that I always sterilize my jars before "canning". I place the tobacco in warm, not hot jars. I sterilize the lids, also. I don't trust the grubbers that manufacture these jars for sterilization! And yes, they seal themselves as aging begins. Looked for mason jars in the commissary today, but decided to check Amazon for a better price. Price aside, Amazon talks to the Ball mason jars (lid and ring, pint size) as being good for dry storage for up to one year! That doesn't sound like a good choice on the surface of things! What should I be looking for? The Mason jars keep food for one year. No problem with tobacco...unless you are going to eat it! @Peck - that's an impressive cellar! How long have you been cellaring tobacco? Dang, if apocalypse comes I'm going to your house. Thanks! Never thought that that was meant for food (only)! Amazon talks to the Ball mason jars (lid and ring, pint size) as being good for dry storage for up to one year! That doesn't sound like a good choice on the surface of things! What should I be looking for? If you get with the program, and realize we're talking tobacco here not you mama's jam, if you can get your mind past that, you're home free realizing that yes, properly jarred, in Ball screw-top jars, kept in a cool, dark place with relativeky low humidity, tobacco will "keep", while you, sir are watching your beard grow, for decades -- many decades, and longer, if you tobacco is virginias. I get it Roth, I think. But I am worried (and johnparker too) about mold/bacteria so I sterilize my jars, utensils and hands when I jar my tobacco. What I can't prevent or account for is the mold spores that may be in the shipped tobacco. There is no prevention for that but at least I know it wasn't caused by my lack of diligence. I guess I trust the supplier and in the fact that tobacco is fairly bacteria resistant. Like you said to Peck: "You can't be too careful." I'm retired. What else to I have to do? Thanks roth, I'll try to pick up some jars soon, and I'll let you all know how the order/jarring goes. I would not sterilize them as long as you use new jars. I posted it here awhile back - on another pipe site, one of the guys is a bacteria tester in the food industry - he did an elaborate thread on testing new jars he bought for bacteria - the new jars had absolutely none in a multitude of tests. He did say that unless you know what you are doing that trying to sterilize the jars can introduce bacteria if you are not careful. This is an intentional thread resurrection. I was wondering how you open the wax sealed jars? I purchased some bulk that came in wax dipped mason jars, but I'm not sure how to open them without dumping some wax into the tobacco below. Is there a recommended process? Is the wax on the lids only? I'd be inclined to melt and wipe it off before proceeding. Carefully, you remove it carefully. I use a knife and work off a piece at a time. And any bits that fall in to the baccy will be noticeable enough to pick out. Just a couple of days ago I went into the local Salvation Army store to look over the bookshelf, and noticed that they had in a couple-dozen old-style Mason jars, I mean with the glass lid and metal bail for $0.79 apiece. I left them there, as I have absolutely no idea whether or not those old-style rubber gasket rings for these jars are still available or even made at all. The bail tops are still made, and are what I prefer for tobacco that's open and in rotation. So, you should be able to find new rings.